Never worry about tangled cords again! Store up to 100 feet of extension cord using this advanced cord reel. It is a simple and easy-to-use device that is uniquely designed to store and dispense all kinds of cords. It divides the cord into two separate compartments as you wind it up. This prevents tangles and knots as you roll, and also makes it incredibly quick and easy to dispense any amount of cord you need. When using the CordPro, you will never have to struggle with jumbled piles of cords, or lengths that refuse to unwind because the are so tangled and twisted. This amazing cord reel and organization device keeps every inch neatly wound and untangled, so you can dispense as much as you want from either end. The male end will feed out one side, and the female end will feed out the other. In effect, you will be left with an extension cord or other roll of cable that is much easier to manage, a snap to wind for storage, and the perfect length for whatever job you are doing. 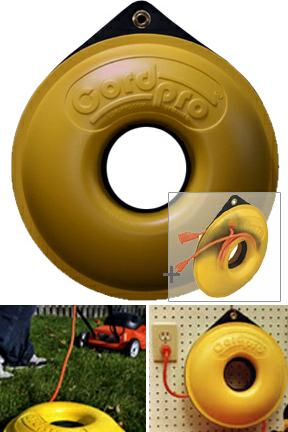 The CordPro works so well because the design is so simple and the materials are commercial grade. It doesn't have any moving parts to wear out and it comes with a Lifetime Guarantee. Essentially there are just two plastic compartments that are stuck together in order to make a fool-proof cord winding and storage device. It comes equipped with a sturdy eyelit and tab at the top, so you can easily hang it up while working or when not in use. It is made from the same material as a truck bed liner is made from, so it can handle a lot of abuse without breaking or wearing out. The material is also specially formulated for outdoor use and is good to minus 100 degrees. The CordPro is great for extension cords, but works on anything flexible. Use it for power cords, air hoses, flat cords, fresh water hose, antenna cables, computer cords and more.This handy device would make the perfect addition to any garage, basement, RV or boat. This is the original size CordPro. If you are looking for a larger size click here. Using the CordPro is easy to load, and even easier to dispense. To get your cords, tubes or wires in there, you want to hold it with the top facing up. At the top tab, flex open one side wall and insert a cord end through the hole in the divider. Next, flex open the opposite side and pull the cord all the way through and out of the opening. Continue pulling until the cord is at the half way mark, leaving the CordPro in the middle. Once this is done, simply take the unit by the center opening and begin wrapping the length of cord, one half at a time. Each half will automatically fall into the correct compartment, and remain neatly wound inside the circle. Winding it up is easy because the ends will wind past each other, not over, so no cords, wires or cables will ever tangle. Winding it up is easy because the ends will wind past each other, not over, so no cords, wires or cables will ever tangle. To use it just plug your cord into an outlet, lay the CordPro on the ground, then pull the other end to the tool or appliance you will be using. As you move the exact amount of cord needed will automatically unwind. No more tangles, no more aggravation, and easy use of all your cords, hoses, and cables. Once in a while a tool comes along that satisfies a need so completely and so simply that it becomes the standard, the last word on the subject of that particular need, a major tool... like a pipe wrench, like locking pliers, like a folding knife; not limited to one size and with far reaching applications. Cordpro is just such a tool. So simple, it's got no moving parts. Great for organizing just about anything that is prone to tangling. Order Yours Today! CordPro - The easiest way to organize your cords and hoses. Use it for extension cords, water hoses, air hoses and more. Perfect for the garage, boat, RV or basement. Comes with a lifetime guarantee. Pre-Cut, Commercial Grade Replacement Line. A Durable Storage Rack For All Of Your Camping Equipment. Wall Mounted Holder. Hang And Organize Up To 10 Chairs. Replacement Rotating Eyelet String Holders For Your PivoTrim Trimmer Head.